In the long, hot summer holiday, any children need the opportunity for organised activities as well as the time to run around outside. 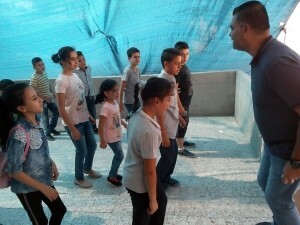 The second is more difficult in Abu Dis where space is increasingly constricted (the “realities on the ground” of the Israeli occupation are pressing in – the Wall, the settlements, the checkpoints – making it a big affair to go outside of town). So local organisations often organise “summer camps” -which, again, are inside the town because it is hard to find safe space for a residential camp. Dar Assadaqa (supported by CADFA) is this year running its 13th summer camp (the first one was in 2006). In recent years, it has also run a winter camp, too, in the January mid-term holiday… But winter is a long way away now, almost unimaginable in the July heat. Here, some of the children are playing in a shaded space on Dar Assadaqa’s small balcony. The summer camp has a varied programme and outings in the local area. Posted on July 30, 2018 by CADFA.